It’s a walker! It’s a ride on. YBIKE Pewi is both! 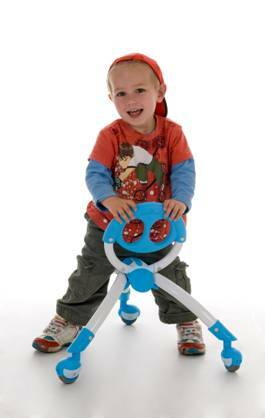 YBIKE Pewi is a hybrid walker ride-on that's designed to help toddlers develop basic motor and balance skills. Kids can sit on Pewi as a ride-on, or hold on and practice walking. It is a perfect gift for a child as young as one year old that can be enjoyed until they are 3 years old! YBIKE Pewi is a kid-powered hybrid “Walking/Buddy” ride-on. YBIKE Pewi lets toddlers as young as nine months old who are crawling or early walkers have freedom of movement to explore their environment. 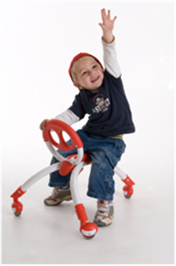 Toddlers test their balance and coordination in two ways: As a ride-on, kids sit on Pewi’s seat while moving around with their feet. The multi directional caster wheels allow freedom of movement in any direction. As a Walking Buddy kids who can pull up to standing hold onto Pewi while walking to improve balance and coordination. Whether standing or sitting, Pewi is a versatile and best selling product that has received numerous awards and parental praise for its unique form and function. • Can be used indoors or outdoors. Will not damage indoor floors. • Light weight sturdy aluminum tubing product weight only 4 lbs. • Maximum weight 20 kgs., 44 lbs.